As the car passed us by, we waved and the driver honked its horn. I have been checking Bing Maps ever since to see if we are on the map and today I discovered that we do indeed make an appearance. 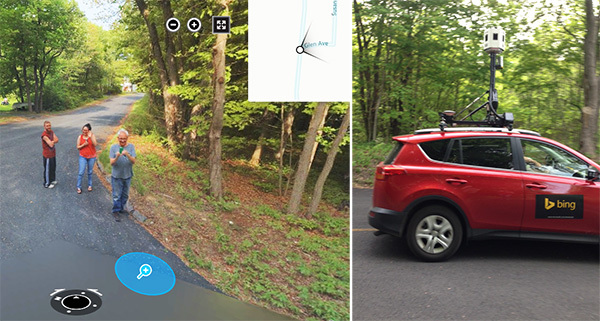 The screen capture of the Bing Maps Streetside image (above left) shows me using my iPhone to capture the photo (above right) of the car as it passed by. To see us for yourself, go to Bing Maps, look up "477 Beecher Rd., Wolcott, CT 06716," then use the Streetside function and see us standing at the corner of Beecher Road and Glen Avenue. Interesting that they did no blur your faces as does Google. Looks like you were having a good time!